I only ran across Diego Valle's blog because he sent me a bug report for OpenHeatMap, but reading through his posts I'm amazed he's not famous for his work. He's calmly telling his story through statistics, but the results are powerful, shocking, and surprising. An epic example is his Statistical Analysis and Visualization of the Drug War in Mexico. With the help of just Benford's law and data sets to compare he's able to demonstrate how the police are systematically hiding over a thousand murders a year in a single state, and that's just in one small part of the article. There's been a lot of discussion about data journalism but few examples have been more than diverting eye candy. Diego shows us how it should be done. If you're like me you'll have read other stories about the drug war down south, and all that sticks in your mind is photos of bodies and the gargantuan number of deaths. With these posts he's given me a fresh and apalling perspective on the details of what that actually means, from a criminal justice system that can't even record the murders effectively, how military interventions correlate with increased death rates, to the impact on Mexico of the US ending its assault weapon ban. 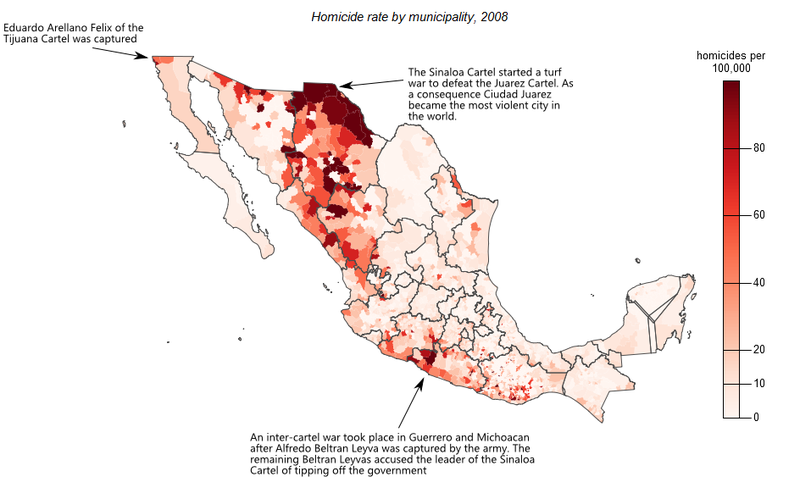 Equally important, he also shows how some of my preconceptions are wrong; Mexico continues to have a far lower homicide rate than Brazil for example, and the violence tends to be highly concentrated in areas the cartels are disputing. Diego's work is important because he's using hard evidence to tell the truth about a vitally important story, and the data hints at how we can get out of this mess. We need people like him working in the tradition of John Snow, applying their analytical skills to illuminate life-or-death problems instead of just Twitter trends.